The Australian pound (symbol £) was the currency of Australia from 1910 until 14 February 1966, when it was replaced by the Australian dollar. 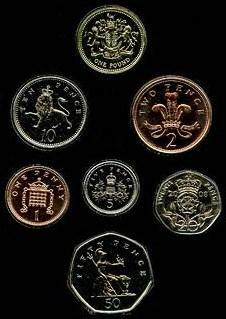 As with other £sd currencies, it was subdivided into 20 shillings (symbol s), each of 12 pence (symbol d). The first European settlement of Australia took place on 26 January 1788 at Port Jackson (modern Sydney, New South Wales). The colony of New South Wales barely survived its first years and was largely neglected for much of the following quarter-century while the British government was preoccupied until 1815 with the Napoleonic Wars. One very important British oversight during this period was the provision of adequate coinage for the new colony and, because of the shortage of any sort of money, the real means of exchange during the first 25 years of settlement was rum, the access to which was controlled by the officers of the New South Wales Corps, who benefited most from access to land and imported goods. Though it did not solve the problem arising from the lack of coins, but in an attempt to put some order into the economy, in 1800, Governor Philip Gidley King issued a proclamation setting the value of a variety of foreign coins in the colony. During this period, to protect the lucrative access to the imported rum, as well as other grievances, the officers, who came to be known as the "Rum Corps", deposed the governor in a standoff in 1808, referred to as the "Rum Rebellion". The New South Wales Corps was recalled soon after. Otherwise, the shortage of coinage persisted. The first coinage issued by the colony took place in 1813, and was effected by punching the middle out of Spanish dollars. This process created two parts: a small coin, which was called the dump, and a ring, which was called a holey dollar. One holey dollar was worth five shillings (a quarter of one pound sterling), and one dump was worth one shilling and three pence (or one quarter of a holey dollar). This was done in order to keep the coins in New South Wales, as they would be valueless elsewhere. From 1817, when the first bank, the Bank of New South Wales, was established, private banks issued paper money denominated in pounds. Acceptance of private bank notes was not made compulsory by legal tender laws but they were widely used and accepted. In 1825, an Imperial order-in-council was issued with the purpose of introducing sterling coinage to all the British colonies. This was due to the introduction of the gold standard in the UK in 1816, and a decline in the supply of Spanish dollars, due to the revolutions taking place in Spanish South American colonies. Most of the dollars used had been minted in Lima, Mexico City, and Potosí, which had become part of new Latin American republics, independent from Spain. In 1852, the Government Assay Office in Adelaide issued gold pound coins. These weighed slightly more than sovereigns. From 1855, the Sydney mint issued half sovereigns and sovereigns, with the Melbourne mint beginning production in 1872. Many of the sovereigns minted in Australia were for use in India as part of a plan that the gold sovereign should become the imperial coin. As it turned out, India was already too entrenched in the Rupee system, and the gold sovereigns obtained by the treasury in India never left the vaults. Thus, in the lead-up to Federation, the currency used in the Australian colonies consisted of British silver and copper coins, Australian minted gold sovereigns (worth £1) and half sovereigns, locally minted copper trade tokens (suppressed in 1881, some state earlier) and private bank notes. In addition, the Queensland government issued treasury notes (1866–1869) and banknotes (1893–1910) which were legal tender in Queensland; and the New South Wales government issued a limited series of treasury notes in 1893. After Federation in 1901, the Australian government assumed power over currency matters and began overprinting the private issues that were in circulation, in preparation for the issue of a domestic currency. In 1910 the federal government passed the "Australian Notes Act" which prohibited the circulation of State notes and gave control over the issue of Australian notes to the Commonwealth Treasury. Also passed in that year was the "Bank Notes Tax Act" which imposed a tax of 10% per annum on "all bank notes issued or re-issued by any bank in the Commonwealth after the commencement of this Act, and not redeemed". In September 1910, the Labor Government of Prime Minister Andrew Fisher introduced a national currency, the Australian pound, with the passing of the Australian Notes Act 1910. 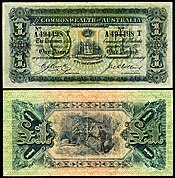 The Act gave control over the issue of Australian notes to the Commonwealth Treasury and prohibited the circulation of state notes and withdrew their status as legal tender. For the next three years, some of the earlier private banknotes were overprinted by the Treasury as a temporary measure and circulated as Australian banknotes until new designs were ready for Australia's first federal government-issued banknotes, which commenced in 1913. Blank note forms of 16 banks were supplied to the Australian Government in 1911 to be overprinted as redeemable in gold and issued as the first Commonwealth notes. The Commonwealth Bank Act 1920 gave note issuing authority to the Commonwealth Bank. In 1960, responsibility for note printing passed to the Reserve Bank of Australia. The new national currency was called the Australian pound, consisting of 20 shillings, each consisting of 12 pence. Monetary policy ensured that the Australian pound was fixed in value to the pound sterling. As such Australia was on the gold standard so long as Britain was. In 1949, when the United Kingdom devalued the pound sterling against the US dollar, Australian Prime Minister and Treasurer Ben Chifley followed suit so the Australian pound would not become over-valued in sterling zone countries with which Australia did most of its external trade at the time. As the pound sterling went from US$4.03 to US$2.80, the Australian pound went from US$3.224 to US$2.24. In May 2015, the National Library of Australia announced that it had discovered the first £1 banknote printed by the Commonwealth of Australia, among a collection of specimen banknotes. This uncirculated Australian Pound (£1) note, with the serial number (red-ink) P000001, was the first piece of currency to carry the Coat of Arms of Australia. The Committee presented its report in August 1960. It recommended the date of introduction of the new system to be the second Monday in February, 1963. In July 1961 the Commonwealth Government confirmed its support of a decimal currency system, but considered it undesirable to make final decisions on the detailed arrangement that would be necessary to effect the change. On 7 April 1963 the Commonwealth Government announced that a system of decimal currency was to be introduced into Australia at the earliest practicable date, and gave February 1966, as the tentative change-over date. On 14 February 1966, a decimal currency, the dollar of one hundred cents, was introduced. Under the implementation conversion rate, £1 was set as the equivalent of $2. Thus, 10s became $1 and 1s became 10c. The conversion rate was problematic for the pre-decimal penny since the shilling was divided into twelve pence. An exchange rate of $2.40:£1 would have allowed for accurate conversion down to the penny, with one penny becoming one cent; however, the Government thought it more important that the new currency unit be more valuable than the United States dollar which it would not have been under a 2.4:1 ratio. In 1855, gold full and half sovereigns (worth respectively one pound sterling and ten shillings) were first minted by the Sydney Mint. These coins were the only non-Imperial denominations issued by any of the Australian mints until after Federation (the Sydney Mint struck Imperial gold sovereigns and half sovereigns starting in 1871, and the Melbourne Mint starting 1872). In 1910, .925 fineness sterling silver coins were minted in denominations of 3d, 6d, 1s and 2s (the last known as a florin). Unlike in the United Kingdom, no half crowns (worth 2s 6d) were issued. Bronze ​1⁄2d and 1d coins followed in 1911. Production of half-sovereigns ceased in 1916, followed by that of sovereigns in 1931. In 1937 a crown (or five-shilling piece) was issued to commemorate the coronation of King George VI. This coin proved unpopular for actual use and was discontinued shortly after being reissued in 1938. In 1946, the fineness of Australian silver sixpences, shillings, and florins was reduced to .500, a quarter of a century after the same change had been made in Britain. In New Zealand and the United Kingdom, silver was soon abandoned completely for the everyday coinage, but these Australian half-silver coins continued to be minted until after decimalization. Examples of private issue paper currency in New South Wales exist from 1814 (and may date back to the 1790s). Denominated in Pounds (and in some cases Spanish Dollars), these private banker and merchant scrip notes were used in Sydney and Hobart through 1829. Private issue banknotes were issued between 1817 and 1910 in denominations ranging from 1 to 100 pounds. In 1910, superscribed banknotes were used as the Commonwealth’s first national paper currency until the Treasury began issuing Commonwealth banknotes in 1913. The Commonwealth Bank Act of 1920 gave note-issuing authority to the Commonwealth Bank. ^ The Pound (in banknote form) was first issued in Australia in 1910 by a limited number of Australian chartered banks. The first year of issue for the Commonwealth of Australia Treasury Note pound was 1913. The pictured note is from the 1913 Second Issue (printed in 1918). ^ Cuhaj, George S., ed. (2009). Standard Catalog of World Coins 1801–1900 (6 ed.). Krause. p. 82. ISBN 978-0-89689-940-7. ^ a b Pitt 2013, p. 180. ^ Cuhaj, George S. (2010). Standard Catalog of World Paper Money General Issues (1368-1960) (13 ed.). Krause Publications. ISBN 978-1-4402-1293-2. ^ Historical rates derived from Tables of modern monetary history: Australia, Tables of modern monetary history: Asia (India's section), and Foreign Currency Units per 1 U.S. dollar, 1948-2005, PACIFIC Exchange Rate Service. Each source may contradict one another. The rates above are the "most plausible facts" derived from these web pages. ^ a b c d Commonwealth of Australia (1963). "Chapter 20. Private finance" (pdf). Year Book Australia. Retrieved 12 July 2013. ^ Department of Foreign Affairs and Trade (November 2009). "Our currency". About Australia. Commonwealth of Australia. Retrieved 12 July 2013. ^ Pitt 2013, p. 158. ^ Pitt 2013, p. 158-59. ^ Pitt 2013, p. 163-75. Pitt, Michael T., ed. (2013). Renniks Australian Coin and Banknote Values (25 ed.). Renniks Publications. ISBN 978-0-9873386-2-4. The dollar is the currency of Trinidad and Tobago. It is normally abbreviated with the dollar sign $, or alternatively TT$ to distinguish it from other dollar-denominated currencies. It is subdivided into 100 cents. Its predecessor currencies are the Trinidadian dollar and the Tobagan dollar. The dollar has been the currency of Barbados since 1935. The present dollar has the ISO 4217 code BBD and is normally abbreviated with the dollar sign "$" or, alternatively, "Bds$" to distinguish it from other dollar-denominated currencies. It is divided into 100 cents. The dollar was the currency of the colony and dominion of Newfoundland from 1865 until 1949, when Newfoundland became a province of Canada. It was subdivided into 100 cents. Canada has an extensive history with regard to its currencies. Prior to European contact, indigenous peoples in Canada used items such as wampum and furs for trading purposes, which continued when trade with Europeans began. Banknotes of the Australian pound were first issued by numerous private banks in Australia, starting with the Bank of New South Wales in 1817. Acceptance of private bank notes was not made compulsory by legal tender laws but they were widely used and accepted. The Queensland government issued treasury notes (1866–1869) and banknotes (1893–1910), which were legal tender in Queensland. The New South Wales government issued a limited series of Treasury Notes in 1893.